What you're looking at is obviously not the official map of The Legend of Zelda; it's what The Legend of Zelda's map looks like to themadjuggler, one of the many contributors to Mapstalgia, a website dedicated to reproducing video game maps from memory. 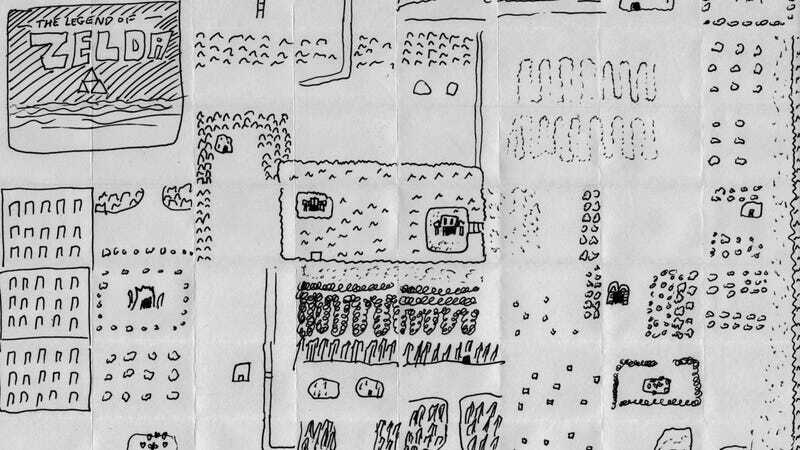 Mapstalgia's Josh Millard is quickly assembling an impressive archive of video game maps as drawn from the minds of the players that lived and died there. From chicken scratch to elaborate computer-crafted creations, each work represents a gamer's experience and the lasting impression video games had on them. The guidelines for participating are quite simple: Draw a map of something from a video game from memory, best as you can remember but no using references. This isn't about accuracy. So take pen to paper, fire up MS Paint, or get all fancy with watercolors, and joi9n the growing army of gamers adding their vision to this wonderful project.